The Uniflame Single Panel Olde World Iron Large Fireplace Screen makes a great addition to any home. This lovely fireplace screen features a traditional single panel design that is paired with a gorgeous Olde World Iron finish, for a look that is sure to please. The Uniflame Single Panel Olde World Iron Large Fireplace Screen measures a grand total of 50 inches in width, which is the perfect size for those with larger fireplaces. This screen includes sturdy legs that will definitely stand up to the heat with ease. Not only does this fireplace screen look amazing and work fabulously, it's priced affordably too, allowing everyone to experience the luxury of Uniflame. What is the height of the large screen? 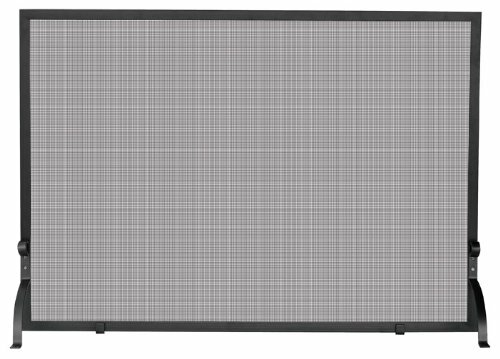 This screen is 35" tall. What is the height of this screen? I can see the width is 50". The height of this screen is 35 inches overall. What is the height of this Uniflame S-1154 single panel Olde World iron screen? This model is 35" tall. Is this screen black or grey? This screen is a dark grey iron color. How deep are the legs on each side? Per the manufacturer, the leg projection for this model is approximately 5 1/2 inches. eFireplace was so speedy and so helpful with questions I had. I have 5 fireplaces in my home and for the money this place has the best value and service. I would totally buy from here again!!! I saw the fireplace screen online, but needed measurements so I called. The staff person was very helpful. We found a screen that was the right size for my fireplace. I placed the order and it was easy and cheap. Then, in four days it was delivered for free. It was very easy to assemble. I screwed in 4 screws to attach the feet and 2 more for the "steadiers." Done. High quality for a low price. I wish I would have purchased a smaller screen. This particular design is very large and bulky. I find it heavy and awkward to move around to get to tend to the fire. I probably should have ordered one half the size - I think it would have still served me well. I am not going to return this screen, but rather, I am going to cut it in half and put my welding skills to use to put it back together. This simple yet made-to-last screen arrived safely and quickly. I really like how it improves the looks of our fireplace area. I was looking for a fireplace screen that would be easy to assemble and very sturdy. This screen is just what I was looking for and am very pleased with my purchase. It is good looking AND sturdy. I am very happy at how beautiful my new screen looks in my den. My only concern is that perhaps I didn't receive the proper floor supports to secure on the bottom of the screen. They seem to be too large for my screen with just a screw to add support. It works out okay because I do not move my screen around, but I am not sure how long it will remain stable. We will see over time. Thank you very much for the level of prompt and courteous service. The screen is very nice looking and is working fine. Although, it doesn't seem as sturdy as it could be. I had done my share of research for a fireplace screen that could align flush with my fireplace surround. This screen is just what I had searched for! It can be put right against the fireplace and blend right in to the fireplace area. The fire itself can be the focal point and not this bigmonster stealing the attention. It does exactly what it was created for - keeping burning embers from popping into our living space. I am very, very pleased with my new screen and would gladly recommend it to everyone. We had wanted a fireplace screen that fit close to the fireplace and not stick out into the room too far. This screen is crafted with supports that can be attached on the sides so that it can be put right up against the fireplace and take very little space. We are very happy with this screen's versatility. So far, this screen has done great. It has a simplistic design and appears well-made. At first I thought it might be prone to tip over, but that hasn't been the case as of yet. I have a very simple decor style and searched for some time looking for a screen that would fit in to my style. This screen is just right for blending in and not detracting from the room. I like how the design of this screen focuses people's attention on the beauty of the fire and not the screen itself. I am delighted with my new screen.